Last Man on Earth joke. Peter has a bunch of nanny goats to "mow" the lawn. the house is a complete mess from the goats as Chris watches TV. Lois is disgusted. She tells Peter to hurry up and get the house clean before Lois' parents come over. They show up before the house is clean. Lois' mom tells Lois she's going to get Lois a nanny. Peter and Chris show up to meet the nanny in a bathrobe and undies. Stewie finds out why Natalia is really in the U.S. She's looking for a mouse. Mickey Mouse kills the Jewish mouse and Peter provides commentary that Mickey Mouse hates Jews. Natalia is reading Stewie Good Night Moon -- or a version of it. Then Everybody Poops -- Blood. Natalia is doing a good job and tells Lois and Peter to go out and have a good time and she'll take care of everything. 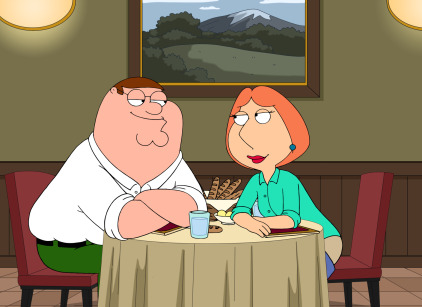 Peter and Lois go out for dinner. They don't know how to communicate because it's always involving the kids. But they have a good time. Peter and Lois are at a couples dinner and they don't like Lois and Peter's new romance and they gab about it afterward in the car. It seems Peter and Lois had had enough of being together. But they are going on a weekend trip anyway. They are not having funny. Natalia and Stewie are having breakfast when someone comes to kill her. She battles them and then escapes on a plane. Peter and Lois relationship weekend is disintegrating. Peter and Lois are headed back home in fight mood. They make up when they get home.